Anyways, let's take a look at the new crossride for Regalia of Wisdom, Angelica, with a lb5 skill shall we? [ACT](VC): Limit Break 5(This ability is active when you have 5 or more damage)[Counter Blast (4), Soul Blast (6)] Retire up to 3 of your opponent's rear-guards. For each unit retired, you may draw 1 card. 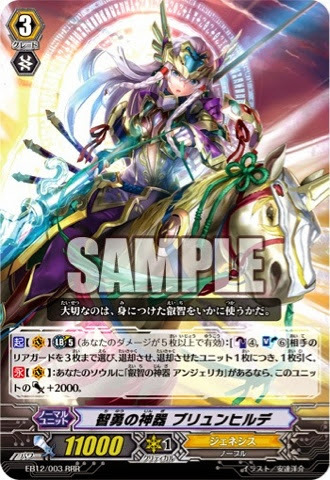 [CONT](VC): If you have a card named Wisdom of the Sacred Regalia, Angelica in your soul, this unit gets [Power]+2000. Okay, abit overcosted, but this is a decent card overall. The lb5 is devastating to many rg-dependent decks(eg, Aqua Force, Nova Grappler) and hand size would not be a problem in this deck with Angelica. The main issue here is deck-out. Your opponent might want to keep you from 5 damage to prevent usage of this card's skill, and as a result from constant soul charging, you would deck-out. To counter this, you may want to run a few legion units in the deck, for extra power pressure as well, since Brundhild does not have much power on her own unless you soul blast Norn or Achiles. You may also wish to run unflippers in the deck, since this card doesn't have Lord(yay! :D), to use the lb5 skill multiple times in one game, but watch out for your deck size once again. The main focus of this deck is to Legion early, pressure the opponent and deplete his hand, then ride Brundhild to wipe the field and win the game. Sometimes i ride Brundhild first, so i would build my hand, and wipe my opponent's field. Once their defenses are withered down, i would ride CEO Yggdrasil to end the game.